Kiribati (pronounced "KiriBASS") is a country in the Pacific Ocean. It has 33 atolls, groups of tiny islands. The country is near the equator. Its capital is South Tarawa, on the Tarawa atoll. Kiribati used to be called the Gilbert Islands. In 1892, the Gilbert Islands became a British protectorate with the Ellice Islands (nowadays known as Tuvalu), together called Gilbert and Ellice Islands. Kiribati became an independent republic in 1979. Kiribati is one of the poorest nations in the Pacific Ocean. It has few natural resources. Tourism is an important industry. 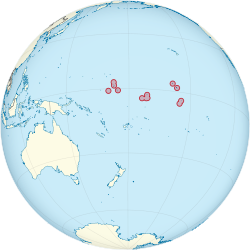 The official languages of Kiribati are English and Gilbertese. ↑ "Kiribati government website". Government of Kiribati. http://www.kiribatitourism.gov.ki/index.php/aboutkiribati/aboutkiribatioverview. Retrieved 24 June 2010. ↑ 2.0 2.1 2.2 2.3 "Kiribati". International Monetary Fund. http://www.imf.org/external/pubs/ft/weo/2012/01/weodata/weorept.aspx?pr.x=76&pr.y=13&sy=2009&ey=2012&scsm=1&ssd=1&sort=country&ds=.&br=1&c=826&s=NGDPD%2CNGDPDPC%2CPPPGDP%2CPPPPC%2CLP&grp=0&a=. Retrieved 19 April 2012. This page was last changed on 23 May 2014, at 18:44.